Tim, Julia and Jim talk about why balance matters - especially for runners - and they give some "quick hit" balance improvement exercises you can start incorporating into your daily routine today. They also explore the idea that balance needs to come first, regardless of whether you're a runner, yogi, pilates pro, or weight lifter - for both physical and mental benefits. 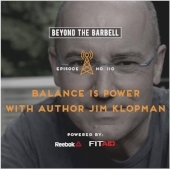 CrossFit competitors and gym owners Ben Aderman and Blair Morrison learn that the hidden secret to improved performance is the human balance system. Learn about how imporved balance was the difference between Mathew Fraser's 2015 2nd place finished and how he crushed the whole field and won CrossFit games in 2016.